Andrei Chikatilo, “The Butcher of Rostov,” was one of the most prolific serial killers in modern history. 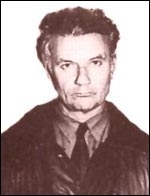 Between 1978 and 1990 in the Ukraine, he committed at least 52 murders before he was caught, tried and executed. The pattern of his murders, though, was irregular. There were long periods of no activity, interrupted by several murders within a short period of time. Hoping to gain insight into serial killings to prevent similar murders, his pattern of behavior was examined by Mikhail Simkin and Vwani Roychowdhury at UCLA. They’vepublished a paper on ArXiv with their preliminary results. What the authors used as the basis of their analysis was the hypothesis that “similar to epileptic seizures, the psychotic affects, causing a serial killer to commit murder, arise from simultaneous firing of large number of neurons in the brain.” Accordingly, they based their model on neuronal firing – the fact that, once a neuron fires, there’s a refractory period that has to pass before it can fire again. When it does fire, it can trigger other neurons to fire if they’re ready to. As you can imagine, though, those firings aren’t always in sync. So what the authors suggest is that there must be a threshold – that is, when a certain number of neurons fire, the serial killer becomes driven by an overwhelming urge to kill. In modeling the mathematics of this, the authors note that, “We cannot expect that the killer commits murder right at the moment when neural excitation reaches a certain threshold. He needs time to plan and prepare his crime.” So they built that delay into their model as well. Moreover, the authors also note that the murders do appear in clumps, with the killer more likely to kill after another murder. However, the killings eventually have a sedative effect, pushing the neuronal activity below the “killing threshold” – which is why there are large intervals of time between groups of murders. The authors add that they could probably fit the data even better “by introducing a murder success rate. That is with certain probability everything goes well for the killer and he is able to commit the murder as he planned. If not, he repeats his attempt the next day. And so on.” They declined to do so in this paper, though, as it didn’t serve the goal of developing a simpler model. I’m fascinated by this particular bit of research, though, and I’m interested to see if other researchers build on this work to build a better understanding of serial killings and other similar impulsive criminal behaviors.